Located in the heart of London’s avant garde creative quarter, moments from both Covent Garden and the British Museum, Radisson Blu Edwardian Bloomsbury Hotel has a fun and modern restaurant with an easygoing attitude to dining. 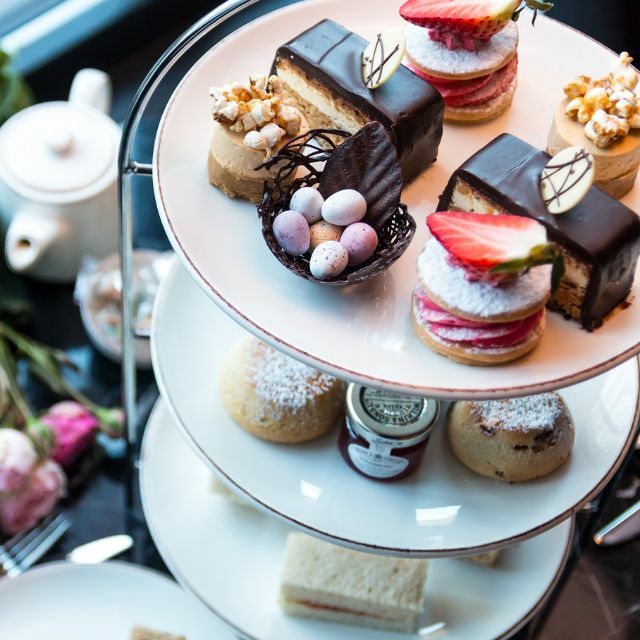 It’s the perfect location for a pre-theatre afternoon tea treat. I would NOT recommend this place for Afternoon Tea. Tue sandwichesnwere dry and stale, and it was overpriced. We had booked but not entirely convinced they were actually expecting us. We were not in a rush fortunately because we had to wait over 30 minutes whilst they prepared sandwiches. They were not brimming with filling and were rather dry. The scones were nice though and the cakes okay. The latter were a bit rich for us but that was possibly just a personal taste. Overall not the best Afternoon Tea we've had and not worth the price. Probably wouldn't rush back. We were seated in the bar rather than the restaurant, tea served without awareness of who ordered what - this being afternoon tea this is kind of the main point - poured without sieve so the tea came out of the pot, requiring a fresh cup. These are small things but if you offer afternoon tea then make sure you deliver the core product well! Zu Beginn haben die unsere Reservierung über Open Tabel garnicht gefunden. Dann wurden wir mit großem Tamtam platziert und dann hat es 20 min gedauert bis uns ein Kellner gefragt hat ob wir schon bedient werden. Die Getränke kamen dann recht schnell. Als dann nach 30 min nix passierte wollten wir dann gehen. Die Getränke gingen aufs Haus. Die waren überhaupt nicht auf afternoon Tea vorbereitet bieten es aber über Open Table an. Ich fand es eine bodenlose Frechheit vom Service uns da sitzen zu lassen und nicht nach zu fragen oder sich unter einander ab zusprechen!! Lovely afternoon tea with helpful friendly staff. However when we arrived they thought from their computer bookings that we had cancelled the afternoon tea although we hadn't. However soon resolved & offered free glass of Prosecco although we declined as do not drink! Food was great but we had to wait half hour to have any food on the table. We were the only ones there having tea and service was horrible. Not sure if I'd go back. We went for Afternoon tea and hade booked a table. Even if we had booked a table we had to wait almost an hour for the food. It were only us (5 persons) and another couple in the restaurant when we arrived so the kitchen was not busy. When the food came it was very tasty and delicious, but the long waiting kind of lowered our overall impression of the Afternoon tea-experience. We booked for a birthday celebration. We loved the venue, food was great and the vegetarian option was wonderful. The staff were very nice! Will be back for another occasion. The food was excellent and the staff friendly. Our waitress was a bit unattentive and we were for some reason seated in a row next to the bar instead of in the comfier seats closer to the windows even though they were all open. Overall the hotel provided quality food, however, we did ask for a jug or water which took 20minutes to turn up at our table. If it weren't for this careless mistake I would've gladly rated the whole experience 5 out of 5. We had a lovely afternoon tea. The food was amazing and the lady who served us was so nice and friendly. We will be coming back in the future. Really enjoyed it all. I booked this experience as part of a Birthday visit to London for my Wife. My wife is a coeliac so a little more planning is needed for meals out and is usually not a problem. After booking with the Radisson I gave them 2 weeks notice asking for the gluten free option for the afternoon tea. When we arrived the staff were always extremely pleasant but the area we were sat for our tea was a reception area by the bar which had businessmen discussing there work and using telephones so not the sort of thing I would expect in a hotel of this standard when they had a nice dinning area. When the teas were brought out I was again disappointed with the result. My tea was lovely apart from there was no Jam with the cream for the scones but the problem was with my wifes Gluten free tea. The sandwiches were ok but she had no scones, these were substituted with 4 squares of water melon and a pot of cream and the top layer of cakes were a chocolate brownie and a bakewell tart both of which had been purchased from a supermarket nothing from the chef. I feel as an experience day this should have been far better and a little more effort gone into it. My wife has had afternoon teas before at different places and never had this before . I did not bring this up at the Hotel as I did not want to make a thing out of it on the day and the waitress was doing her best but I thing you should look at this before sending people there for what are normally gifts and treats. The food was so yummy, the staff are polite and friendly. I took my mum for a pressie and she thoroughly enjoyed herself. This did not go well from start to finish. The telephone number on the afternoon tea voucher that I had been given got me through to someone who had no idea what to do. I got passed around the company and left waiting for someone to answer so long I gave up. Eventually I emailed customer service and was assured all would be fine. When I presented the voucher on arrival the staff behaved as if they'd never seen one before. The food was poor - one scone so stale it was inedible and another scone wet underneath and soggy. We didn't finish the tea. The final insult was a bill for the full price ignoring the voucher so had to be challenged and a member of staff who was sulky about being asked to correct it. Excellent service. Bar area was too noisy for conversation. We asked to be moved to a quieter area and were moved to the restaurant area, which was ideal for us. Quiet and cosy for a girls get together afternoon tea and coffee. Staff very pleasant, helpful and attentive. Could not have asked for more.